When I hear calls from elected officials to suspend the US Refugee Admissions Program, I have to wonder just who are they trying to keep out? If they are anything like the refugees and displaced Syrians I have met and interviewed, they are exactly the kind of people who can help do what President Trump staked his whole campaign on: make America great again. 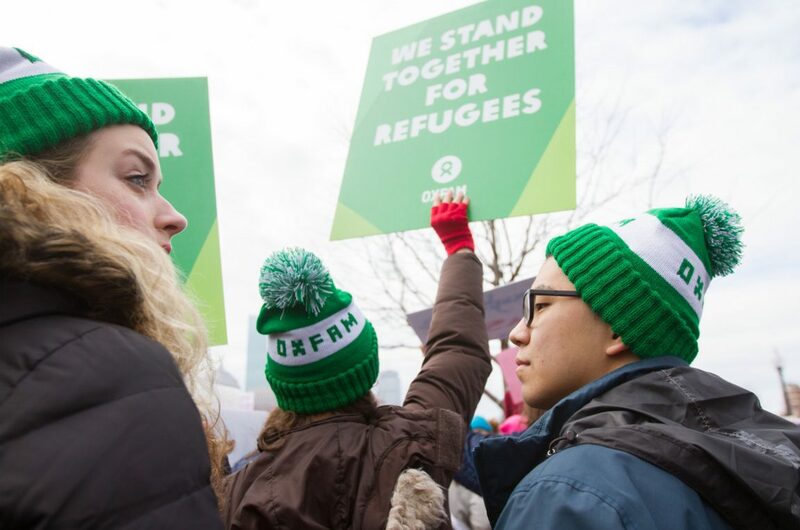 Take action now: Tell President Trump that we cannot slam the door on refugees. They are the same kind of people many of us descend from—immigrants who dared to think big and had the courage to pursue their dreams here. You know some of their names. They’re people like Madeleine Albright, who was born in Czechoslovakia and became the first woman to serve as Secretary of State in the US. Surely you have sung at least one of their songs, like God Bless America, by Irving Berlin who was born in Russia. And maybe you’ve even had the thrill of hiking through Yosemite National Park, preserved today in part because of the foresight of Sierra Club co-founder John Muir, who emigrated with his family from Scotland. In the face of trumped-up fears about foreign nationals, it’s easy to forget the accomplishments of immigrants who have paved the way for us, helping to shape our culture (band leader Dave Matthews was born in South Africa), build the businesses that drive our economy (Google co-founder Sergey Brin was 6 when his family moved here from Russia), and prod, for the better, our collective conscience (the late Nobel Peace Prize winner Elie Wiesel was born in Romania). Campaign-fed xenophobia about refugees has also made it easy for us to ignore questions of the heart, which is where the truest answers are often found: How do you carry on when everything you once loved is gone? It takes enormous hope, courage, and drive to start over in a strange new place. Our ancestors could have told us that. So could any refugee. It’s those very elements—those quintessential American traits of optimism and determination—that the Syrian families I have met in Massachusetts, West Virginia, and Illinois have brought with them. “In America, any dream or anything you want, you can accomplish in this country,” 20-year-old Samhar Assaf told me last summer. He dreams of going to college and possibly having a career in law enforcement. With that drive comes a love for some of the things Americans treasure deeply, but tend to take for granted, perhaps because we don’t know what it would be like to live without them. “The order in America—it’s the best,” said Ahmed Abizaid, the father of five children who still marvels when he sees a car stopping to let someone cross the street. For Feras Shawish, who was an anesthesiologist back in Syria but is now working as a receptionist in a medical clinic, the freedom to speak his mind is what he relishes most. But that right, and many of the others that make our country the envy of much of the world, are hard-won for refugees in the US. Despite what some officials would have you believe, it’s not easy for a refugee to secure the privilege of resettlement here: It can take up to two years and more to complete what was already a thorough vetting process, including numerous in-person interviews and layers of security checks. Some people don’t have the luxury of that kind of time. One of them was the young son of Abad Hassan. Born with a severe heart condition, he died a few days after his first birthday as his family waited desperately for permission to move to the US. Oxfam’s Joelle Bassoul had drawn attention to Hassan’s struggles to get medical care for the child, but the gears of bureaucracy didn’t move fast enough. Though the family was, finally, able to resettle in Florida, the move was bittersweet. But any actions to suspend the refugee program would make it too late for many others. Is this the kind of nation we want to be—a country that further punishes people for fleeing a kind of carnage few of us can imagine?